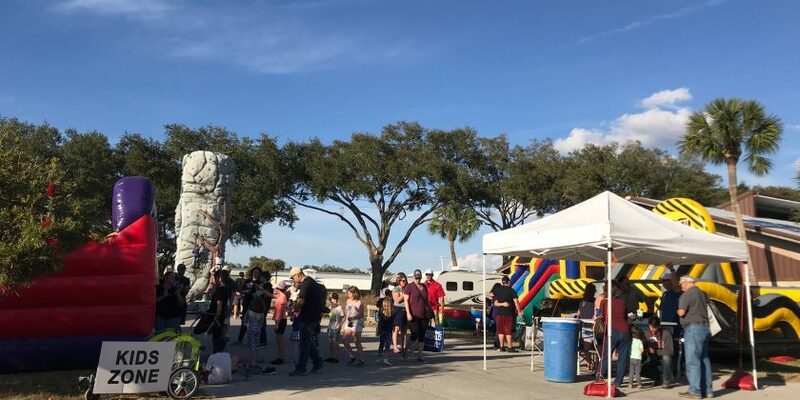 Did you know that the Florida RV Supershow is the greatest RV Show in the country? It’s no wonder so many people come from all over the country to attend this show. Have you been looking for a new RV or adventure vehicle? Keep reading to learn our favorite things about this incredible show! Our family of four had a BLAST! Our kids are a bit RV obsessed because they’ve been RVing full time in our fifth wheel since they were 1 and 3 it’s pretty much all they know. This was our second year attending but our first year being there the entire week. It was super neat having the chance to see and meet RV manufacturers that specialize in custom work. We had the chance to tour custom RVs such as New Horizons RV, ShowHauler, and Spacecraft Manufacturing just to name a few. 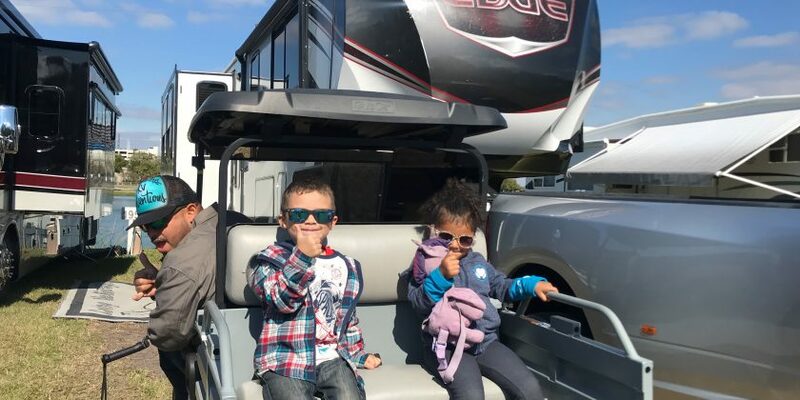 We had the opportunity to talk to their representatives and were really impressed with the amount of RVs they make per year because they are completely custom and devoted to delivering the best RV for their customer. Larger RV manufacturers complete about 15 RVs per day I was surprised to learn some of the companies I mentioned above complete as little as 26 RVs per year! The craftsmanship and attention to detail was very impressive. 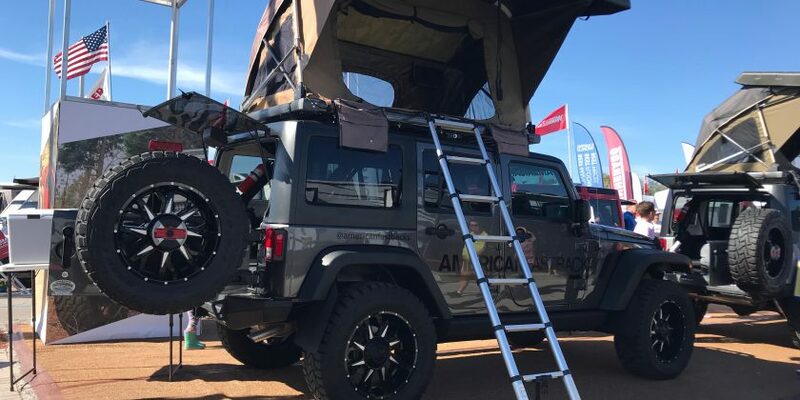 Thanks to the RV show we had the chance to check these unique RVs out. The only way to truly see them is traveling to their manufacturing facility or finding one for sale or bumping into someone on the road that owns one and asking them to tour it. 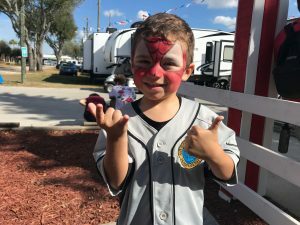 The entertainment they have at the Florida RV Supershow is pretty high on our list of favorites. This year we had the chance to experience more of the entertainment because we were there camping all week. Our kids loved Magic Mike who made them balloon animals and funny jokes while he made laser guns, swords, and teddy bears. We had the opportunity to also see the parade they have of all the entertainers which was entertaining and perfect while we were taking a small break. Saturday and Sunday the kids had a blast hanging out in the Kid Zone. We were expecting bounce houses but did not realize how much more goes into the Kid Zone. They had the opportunity to make Wax Hands, get their face painted (which they absolutely LOVED), and have more balloon animals done. The staff that was in charge of giving the kids their wristbands and checking them in were super friendly making the whole experience that much better. Oscar the robot had fun making fun of dad, we saw a one man band singing away as he walked the grounds, saw a friendly armadillo pulling a buggy (the original RV), an entertaining man on stilts, and a singing boat just to name a few. Having the opportunity to meet actual builders was a very unique opportunity. Many of them were open to talking on camera and sharing what makes their RVs unique. We have never really had that experience which was a fun first. One of our favorite booths at the show because we found it to be one of the most helpful was Lippert Components. If you didn’t know many of the items inside RVs come from Lippert (landing legs, stoves, faucets). They dedicated their booth to answering questions from customers. They had the friendliest people representing their booths and we actually had the opportunity to meet someone we had virtually met and emailed last year. When you attend next year make sure to check out Lippert Components booth plus if you need to charge your electronics they have free booths to go take a seat and plug in. This was a first for us and we recommend it to anyone that is able to attend on industry day to check it out. It was the quietest day and gave us the chance to meet a ton of manufacturers and ask all the questions we had. We spent about an hour at one of the booths asking away and they seemed to love answering our questions. Industry day is the day before the RV show opens to the public and it’s free for RV related businesses or companies. It was a great way to network and visit all of the booths and catch some great sales on products. You can see our recap of Industry Day right here: Industry Day Video. We loved the convenience of camping in our RV there at the show. This meant not having to drive in traffic every morning and having the convenience of waking up eating breakfast and walking over. Seriously made it that much more fun and convenient! We had the chance of going back to the RV whenever we were tired or the kids needed a break. Having friends camping there was nice too because we were able to hang out and share what we had seen that day. If you have the chance to bring your RV to the show we recommend staying at the fairgrounds to make it more convenient each day. Who Will Be There Next Year? Our list of favorites can go on and on because we really enjoyed the RV Super Show and can’t wait for 2020’s because I know it will once again exceed our expectations. We can’t wait to see new RVs and make new friends. Who will we see at the next Florida RV Super Show?